In the Interactive Chart, you can display data for selected Backbone tests as a histogram. The histogram shows the frequency of data items in successive numerical intervals of equal size. It depicts the distribution of test results to quickly identify tests with results that require further analysis. For example, the histogram may chart the response times for all test runs for selected tests in the last 7 days. The x-axis shows the distribution of response times from fastest to slowest, and the y-axis shows the number of tests in each response-time interval. You can see at a glance which tests had the most test runs with relatively slow response times. When the histogram charts multiple tests, each test is identified by a unique color, so you can see the relative number of test runs for a given test by response-time interval. 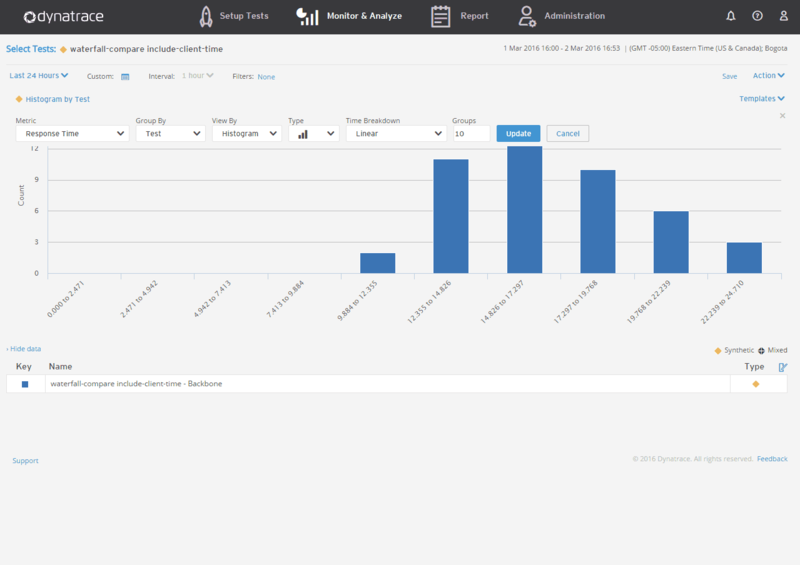 Hover over a histogram bar to view test details, including the number of test runs during the time interval. Click <Metric> by <Group> (e.g. Average Response Time by Test) above the Interactive Chart. Metric – You can only use Response Time (Time > Response) for a histogram. Group By – Select either Test or Step. View By – Select Histogram. Type – When you select Histogram, the chart type is set automatically. Time Breakdown – The options for a histogram are Number of Seconds, Linear (the default), and Logarithmic. Groups – Specify how many intervals to display along the x-axis. The default is 5. Use the controls above the chart to change the time frame and filter the chart. You cannot change the interval. Use the Select Tests option to add or remove tests from a histogram. All commands on the Action menu are available for a histogram, for example to share the chart or to export the data. You cannot drill down from a histogram. However, after you use the histogram to identify tests with results that need further analysis, you can chart those tests using any other View By option, and drill down from that chart.